Chris Martyniuk, assistant professor in UNB Saint John’s department of biology and researcher with the Canadian Rivers Institute, recently received the Bob Boutilier New Investigator Award from the Canadian Society of Zoologists (CSZ). The award is designed to acknowledge CSZ members within five years of receiving their first academic or professional appointment. The individual must have made significant contributions to zoology and to be considered a rising star in their field. 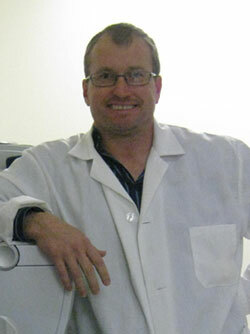 Dr. Martyniuk’s research is pioneering in the field of genomics and proteomics for ecotoxicology research. As the Canada Research Chair in molecular ecology, Dr. Martynuik’s and his team of students have developed state of the art molecular tools to assess the biological impacts of aquatic pollutants in fish. He will contribute a plenary presentation on the advances and limitations of Omics technologies in environmental science at the annual CSZ meeting. "This is a tremendous honour, and I thank all of my colleagues throughout Canada for my nomination and selection for this award," says Martyniuk.